4.2 What are textile-based sensors? The integration of electronics into textiles and clothing has opened up an array of functions beyond those of conventional textiles. These novel materials are beginning to find applications in commercial products, in fields such as communication, healthcare, protection and wearable technology. 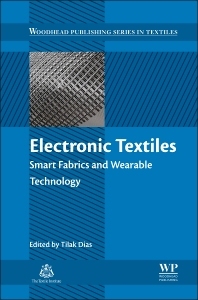 Electronic Textiles: Smart Fabrics and Wearable Technology opens with an initiation to the area from the editor, Tilak Dias. Part One introduces conductive fibres, carbon nano-tubes and polymer yarns. Part Two discusses techniques for integrating textiles and electronics, including the design of textile-based sensors and actuators, and energy harvesting methods. Finally, Part Three covers a range of electronic textile applications, from wearable electronics to technical textiles featuring expert chapters on embroidered antennas for communication systems and wearable sensors for athletes.